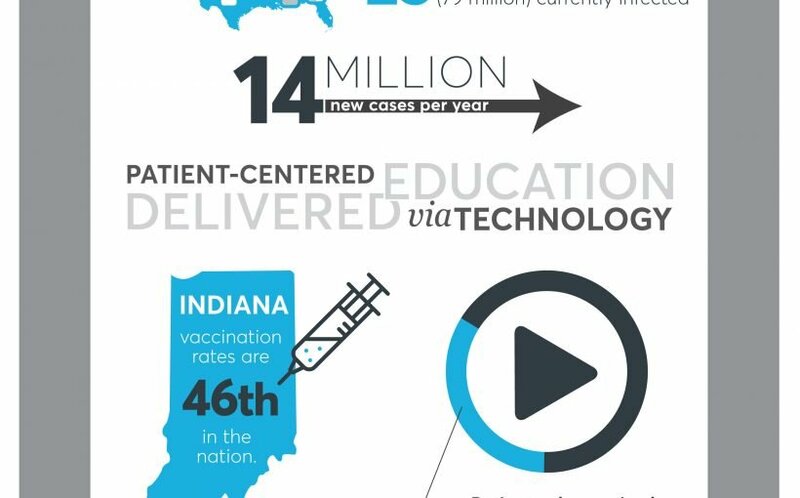 The research, performed by Regenstrief Institute, Indiana University School of Medicine and Indiana University Richard M. Fairbanks School of Public Health at IUPUI and funded by Merck & Co., Inc., showed that patient-centered education strategies delivered at the doctor’s office could lead to more people choosing HPV vaccination. 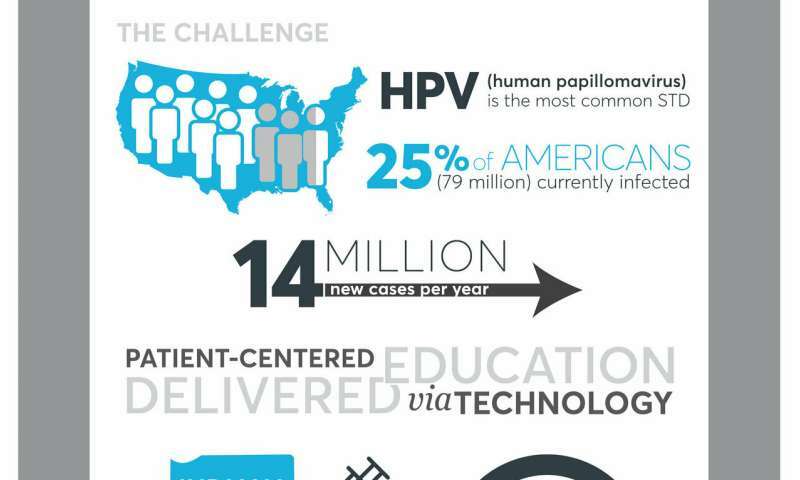 HPV infection is linked to several types of cancer, including cervical cancer. The CDC estimates that 80% of sexually active people will be infected with at least one type of HPV at some point in their lives. Although the HPV vaccine demonstrated high clinical success rates against certain cancers, vaccination rates in adolescents remain low. In the study, researchers found that parents of children who watched an educational video about the HPV vaccine at a medical clinic while waiting for the provider had three times greater odds of choosing to receive a dose of the vaccine. “These results are very promising for those concerned with public health. If we can educate patients/caregivers at the doctor’s office, where they can take immediate action for their health, we can ensure more eligible patients receive the HPV vaccine, potentially saving lives as well as healthcare dollars spent on treating disease,” said Brian Dixon, Ph.D., primary author of the study. Dr. Dixon is the director of Public Health Informatics at Regenstrief and the IU Fairbanks School of Public Health and an associate professor at IU Fairbanks. For this study, the research team developed the video detailing the risks and benefits of the vaccine. At intervention sites, parents of children who had not received the HPV vaccine or had not completed the vaccine series were shown the video while they waited in the examination room of a pediatric clinic during a routine visit. The researchers used electronic health records as well as the state’s immunization registry system to identify patients eligible for this intervention. In the 7-month cluster randomized trial, 1,596 eligible adolescents ages 11 to 17 were included. One-third visited a clinic where the video was available. The study is unique in its approach of targeting families directly using technology in the context of the clinic exam room. Dr. Dixon explained, “Previous studies sought to prompt provider recommendation of the vaccine via electronic health record alerts. This study sought to educate patients about the vaccine and prompt them to initiate a conversation with their provider. Providers listen to patients and are willing to offer their advice about vaccines when asked.” The study results suggest that spurring patients to initiate conversations about vaccines is as effective as prompting providers to initiate these conversations. Although promising, the study did have limitations that will require more research and efforts to integrate the intervention into clinics. A larger study in multiple settings will help the researchers improve integration of the intervention into pediatric as well as family medicine settings. “With better integration, we would expect even greater effects than what we observed in this study,” said co-author Stephen Downs, M.D. “This method could go a long way toward improving vaccination rates.” Dr. Downs is a Regenstrief scientist and the director of Children’s Health Serves Research and the vice chair for general pediatrics at the Indiana University School of Medicine. The study was funded through the Merck-Regenstrief Collaborative, an ongoing, multi-year collaboration between the two organizations that seeks to improve the health of patients through data analytics, healthcare innovation, education and research.